I wish they had have kept the coins. Deathsanras wrote: I wish they had have kept the coins. 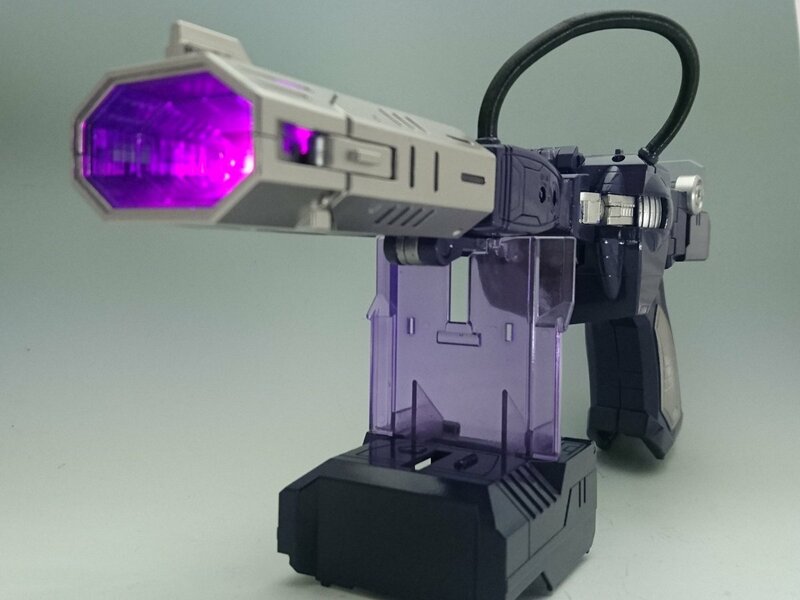 Did Shockwave ever wield Megatron in gun mode? I don't remember his doing so. Also, something I never noticed about the figure's packaging until now is a name discrepency between the Latin script and the Katakana. While the Latin script writes his name as "Destron Laserwave", the specific Katakana characters that correlate with his name write it instead as just "Laserwave". The word "Destron" is included, but not as a part of his name. It is included separately from his name in the usual placement that simply denotes a MP's faction. Therefore, while the Latin script might have had Trademark issues in using just "Laserwave", the Katakana evidently did not. Sabrblade wrote: Did Shockwave ever wield Megatron in gun mode? I don't remember his doing so. Only Soundwave, Starscream, Skywarp, Optimus Prime and Autobot Spike. You bastards! Why must you torture us after we've already purchased & own a Shockwave?! That's Takara or Hb problem right? And since this is an Asian release, no problem with this TM non issues. The packaging is the same Takara packaging as the original release. The name difference between the Katakana and Latin script is just something I only just now noticed. I'm usually one to shy away from customizations, but this one is temporary so I can always undo it later on. 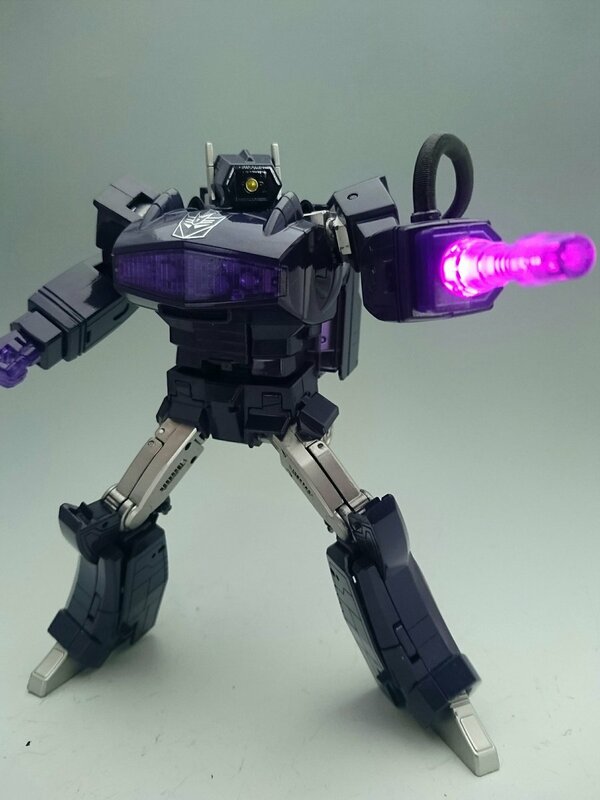 One of the things that drives me nuts about Takara-Tomy's Masterpiece Shockwave is the garbage light-pipe eye; while great in theory, 95% of the time the eye just looks like a dull lime green as the yellow mixes with purple and no light passes through the back. So I popped out the eye, and in keeping with the original G1 toy, just found a reflective metallic surface to replace it with. In my case I used the copper end of an old RCA cable. Works great, and now the eye looks great no matter the lighting conditions. I'm really surprised no 3rd party has offered a better-fitting solution to achieve the same goal. 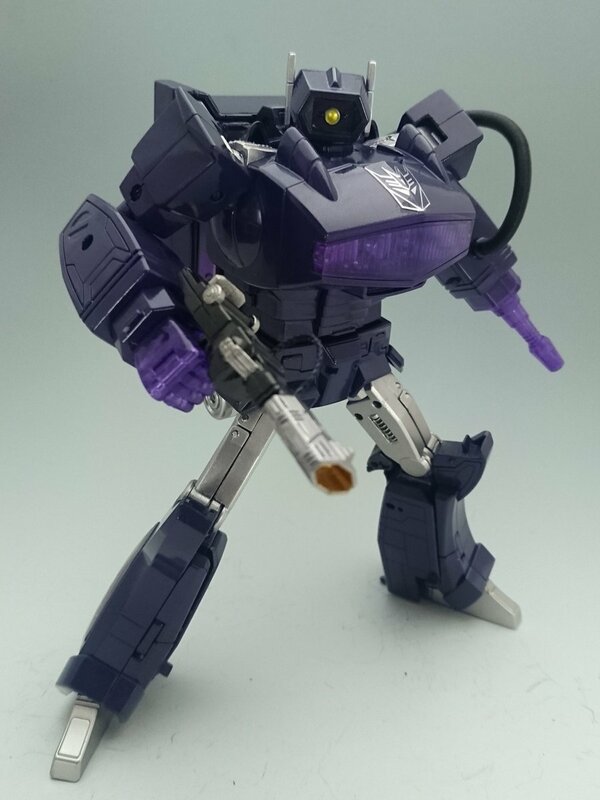 Still holding out hope we'll get a toy-accurate repaint of Shockwave at some point that does away with the grotesque lavender plastic and grey matte parts. Spanbauer wrote: I'm usually one to shy away from customizations, but this one is temporary so I can always undo it later on. One of the things that drives me nuts about Takara-Tomy's Masterpiece Shockwave is the garbage light-pipe eye; while great in theory, 95% of the time the eye just looks like a dull lime green as the yellow mixes with purple and no light passes through the back. So I popped out the eye, and in keeping with the original G1 toy, just found a reflective metallic surface to replace it with. In my case I used the copper end of an old RCA cable. Works great, and now the eye looks great no matter the lighting conditions. But the back of the head is now left open right? Why not paint over the clear plastic with something like chrome gold or something? sol magnus wrote: I still have a faint glimmer of hope for a new Megatron. Your are not alone friend. I was thinking and I wouldn't be surprised if we see a new Megatron and a new Grimlock (or an up-scaled MP-8) next year for the TFTM 30th Anniversary. As prominent characters in the movie and the only pre-MP-10 figures left to re-do. MP-29 has the single best light-piping gimmick I've ever seen. It's enough to just put him in front of a white wall and the thing lights up. Even when the room is in darkness and only the TV or computer screen is on, his eye glows..
Do you display him under a low shelf or wall cabinet? That would probably block the light. Maybe Nonnef will come up with an opaque replacement piece. True, the back of the head is open, but that doesn't bother me. I wanted a temporary fix in the event a toy-accurate repaint of the Shockwave mold is ever released, in which case i'd sell this version. Yeah on my shelf, no light enters the eye. Even off the shelf, for me it almost always looks dull lime green (like in the photo) unless I deliberatelty hold him up to the light. I know. Like I said, I wish they'd kept it. It wouldn't surprise me to see something like this from Takara, because they still haven't used the MP-29 mold for anything else than the original release. Looks like he's carrying the Astro Magnum / Galactic Man gun. We can haz Astro Magum deco as new character? JelZe GoldRabbit wrote: We can haz Astro Magum deco as new character? Or at least as his mass production clones from the Devastation game (MP troop builder!). "Shackwave" or just a coloring snafu of Shockwave pre earth war? Reflector is gray and not blue so must be the former but then again, I wouldn't put it past takara to milk the mold for all it's worth. 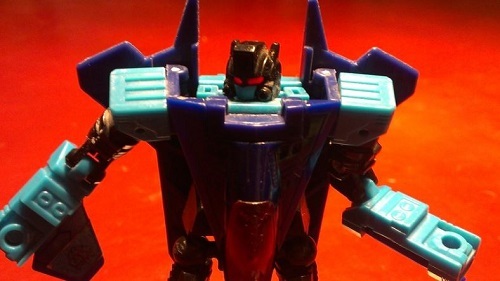 Looks like "toy" Laserwave gets proper Decepticon tampographs on his forearms instead of stickers. Interesting. 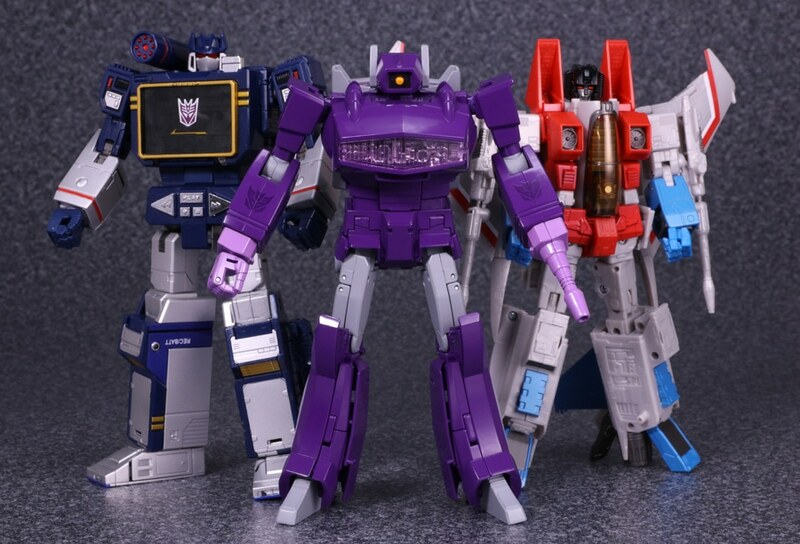 Sabrblade mentioned in the "Masterpiece Rumors" thread that MP-29+ is actually being advertised as "anime accurate." 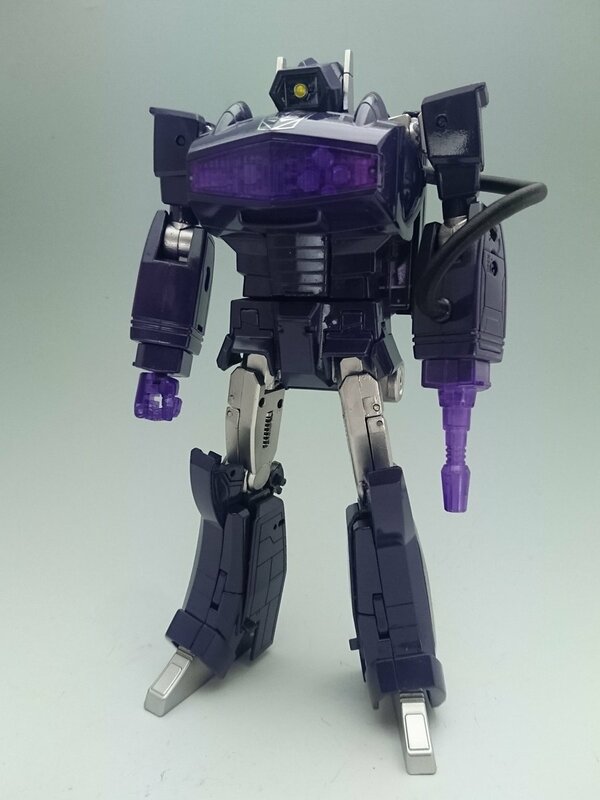 If Takara is calling this darker purple version anime accurate, what on earth is the original release accurate to? It's certainly not the G1 toy! Plus 360° turn-arounds in both modes..
4,843 pages were recently viewed by 725 unique visitors. This page was viewed 1 times on Thursday, April 25th 2019 1:33pm CDT. © 2019 Seibertron, Inc. DBA Seibertron.com. All Rights Reserved. Established June 2000. Seibertron.com is owned by Ryan Yzquierdo.